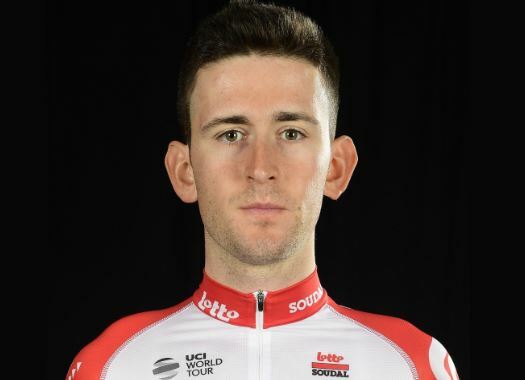 Lotto Soudal's Tiesj Benoot has undergone further examinations after the crash in Paris-Roubaix that discovered new serious injuries. The Belgian rider was trying to return to the peloton after a small crash when he crashed against Jumbo-Visma's car which left the vehicle without the rear windscreen and the rider with several injuries. The night of the race it was reported that he had some bruises and a cracked collarbone but new examinations discovered new injuries. "The scan showed that Tiesj has a fracture at the end of his collarbone," explained team doctor Maarten Meirhaeghe. "He won’t need an operation. Besides the bruises, the cuts and the abrasions, he has a large torn muscle in his upper leg. "The first couple of weeks, he will need to rest, obviously. In case the wound heals well, he could restart training on the rollers." The rider also explained with more detail the entire incident. "After a flat tyre, a bike change and my first crash, I was chasing with Wout Van Aert," Benoot commented. "At a road narrowing, a team car had to stop and dodge abruptly, causing me to crash into its back window. "I have never felt so much pain before in my hip and upper leg. If I am being optimistic, it’s better to have this kind of injury now than in the Omloop, but of course, it is a bummer. I hope to be able to train on the rollers again in a few weeks, to not let the rest of my season be in jeopardy."